KIEV, Ukraine—The Ukrainian presidential election will head to a runoff April 21 after Volodymyr Zelensky received 30.3 percent of the Ukrainian vote and current President Petro Poroshenko received 16 percent in the first round of voting, according to exit polling. Observers say Ukraine's hopes for NATO membership may be in jeopardy with the possibility of a new president. Ukraine's sitting president, Poroshenko had been working toward membership in the European Union as well as the NATO alliance. 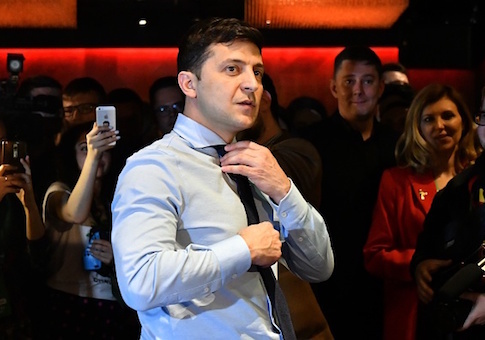 Zelensky had been leading significantly in the polls up until the March 31 vote, but his lead in exit polling was much higher than anticipated. The Ukrainian constitution only allows for two candidates on the final ballot. Zelensky in contrast to Poroshenko has no political experience. He has a majority of the youth vote in his corner. His name recognition and popularity are due to his roles on television and as a member of a well-known comedy troupe in Ukraine. It would be as if, said one diplomat in Kiev, "a popular star from America's popular Saturday Night Live show ran for president and received almost double the votes of the sitting U.S. commander-in-chief." Zelensky's youth and inexperience have been touted by a number of commentators as real dangers for Ukraine—should he defeat Poroshenko in the April 21 second round election. Observers who look skepticly at a Zelensky presidency say that efforts to join NATO could falter should he be the next-round victor. Ukraine under a new president could be drawn further into war with Moscow, they say. Most NATO members are not interested in a direct confrontation with Russia and would shy away from offering Ukraine a place at the table. In this scenario, Russian President Vladimir Putin could a new offensive in the Donbas using a fabricated Ukraine provocation as justification. Then at a critical moment, Putin would offer to sit down and negotiate with the new, inexperienced Ukrainian president and attempt to out-maneuver or intimidate him. The result could be more loss of life and territory and no future prospects for NATO membership. The history of Ukrainian presidential elections in this century is a troubled one. A 2004 election was declared to have been rife with falsification by the supreme court, resulting in a second presidential ballot that was won by Viktor Yushenko in early 2005. Five years later he failed in his re-election bid against Viktor Yanukovych, a pro-Moscow candidate who Yushenko beat in the previous election. Yanukovych was forced to flee the country in February 2014 when the massive Maidan Revolution threatened to spill over into civil war. At the time, Yanukovych had lost control of his security services and more than 100 protesters had been shot dead on the main square in Kiev. Armed protesters threatened battle with the security forces, at which point the highly unpopular president flew from Ukraine to exile in Moscow where he remains to this day. Poroshenko was then elected in a snap election in March 2014. Poroshenko's time in office has been beset by accusations of corruption. Some of the scandals have involved the defense budgeting process and the country's arms export and military procurement monopoly, UkrOboronProm. This has become a larger issue as the Ukrainian military continues to battle a Moscow-backed invasion and insurgency in the Eastern Donbas region. In an article for Real Clear Defense written in January 2017, former U.S. Naval officer James Durso quoted a former senior Ukrainian military officer as stating that almost half of the defence budget was being stolen. What is not being stolen, according to others whom he spoke to, ends up as orders to "factories indirectly owned by President Petro Poroshenko," and that this "staggering corruption divides the self-interest of the elites from the national interest." Durso worked in Iraq with the Coalition Provisional Authority and was also a member of the commission examining wartime contracting in Iraq and Afghanistan. The stream of reports like his and so many others partially account for the fact that some of Zelensky's strongest support in the polls came from the same embattled Donbas provinces that border Russia. Poroshenko downplayed the idea that Ukraine's prospective NATO membership was in jeopardy. He told a crowd of his supporters that with Sunday's elections "Ukraine had successfully completed its test for Europeanization" and that "this solidly supports the course for Ukraine to enter the EU and NATO." The head of Poroshenko's party in the parliament, Artur Gerasimov, stated that the only real loser in this election was the Kremlin "in that the [election] procedures were all conducted transparently and democratically." This positive note about this election was echoed by a manager at a well-known downtown Kiev wine shop. "In our election here there is actually some question as to who the next president will be. Over the border in Russia, there is never any mystery—you know it's going to be Putin no matter what. The Russian elections are a sham—theatre of the absurd. Despite all our other shortcomings today shows we are still more advanced politically than the Russians." This entry was posted in National Security and tagged Ukraine. Bookmark the permalink.